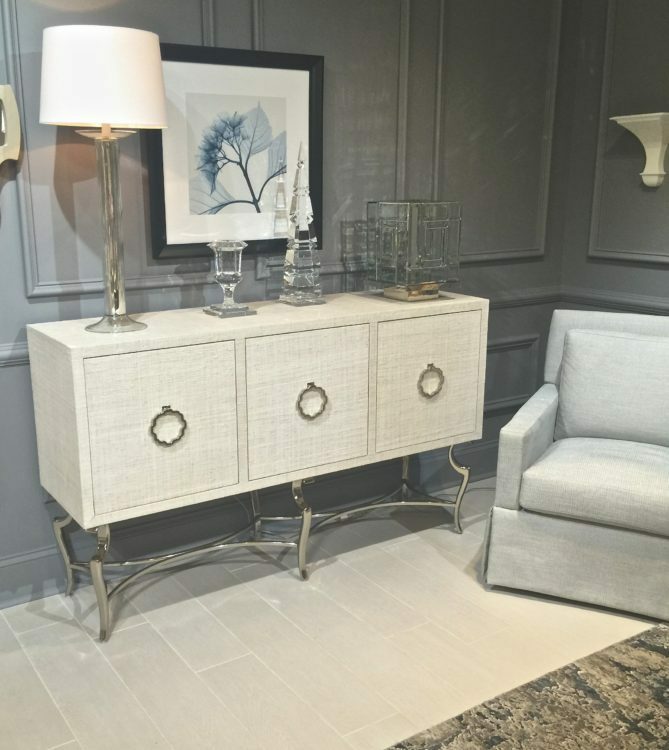 Twice a year we attend #HPMKT in High Point, North Carolina to see what’s exciting, what’s trending, and what’s new in the world of furniture, lighting, art and accessories. With over 2000 exhibitors showing their wares spread out over 180+ multi-story buildings, there is no way to see everything, but we do the best we can. 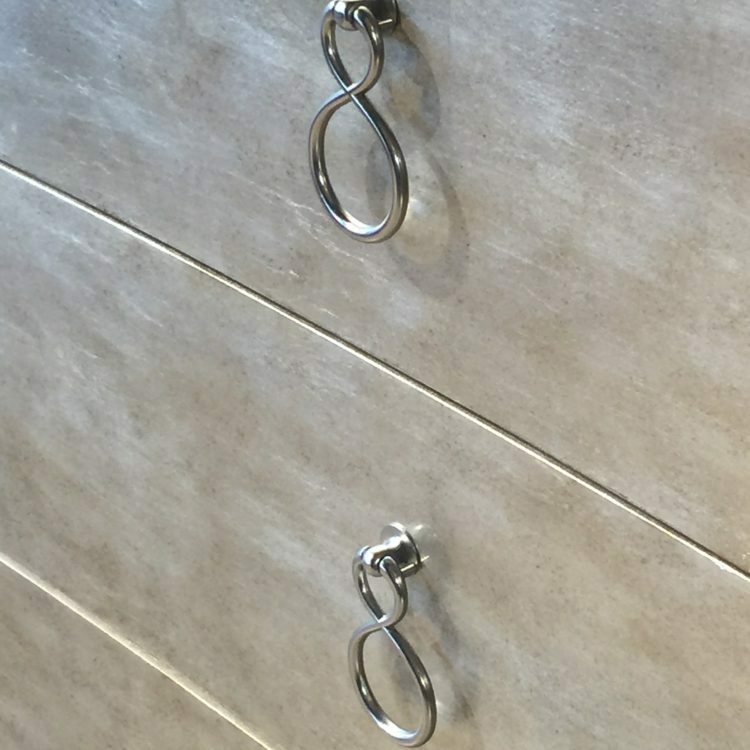 This market, luxury hardware on furnishings was taken to an entirely new level. 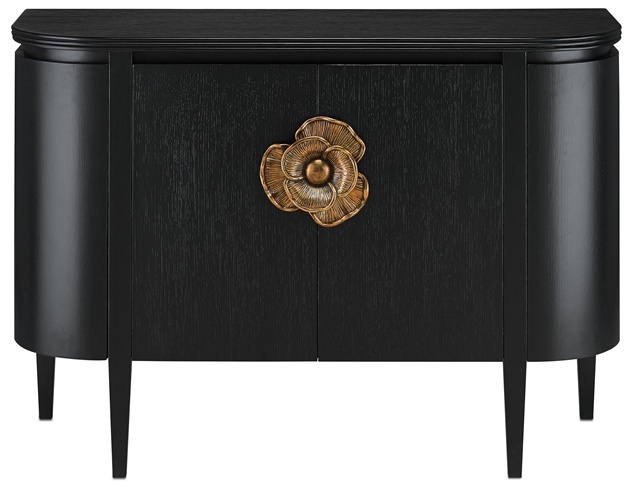 The Briallen Demi-lune chest by Currey & Company is a great example of hardware at its finest. 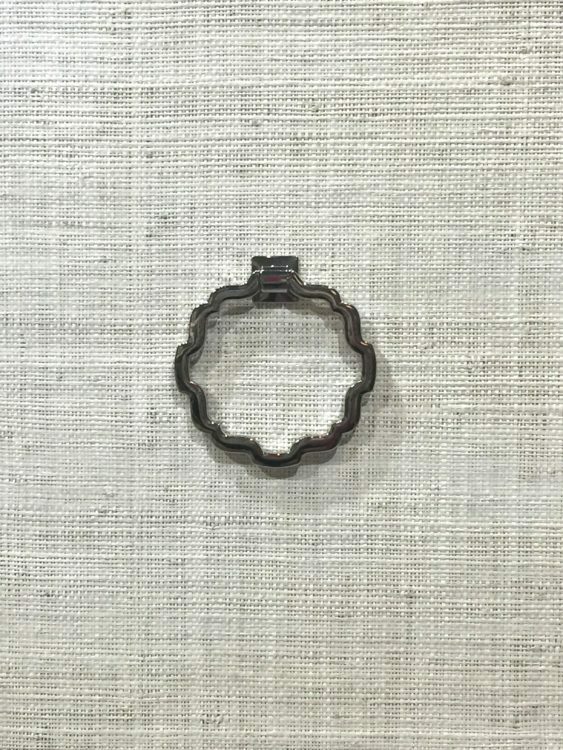 It was as beautiful and as finely crafted as any piece of your favorite jewelry. 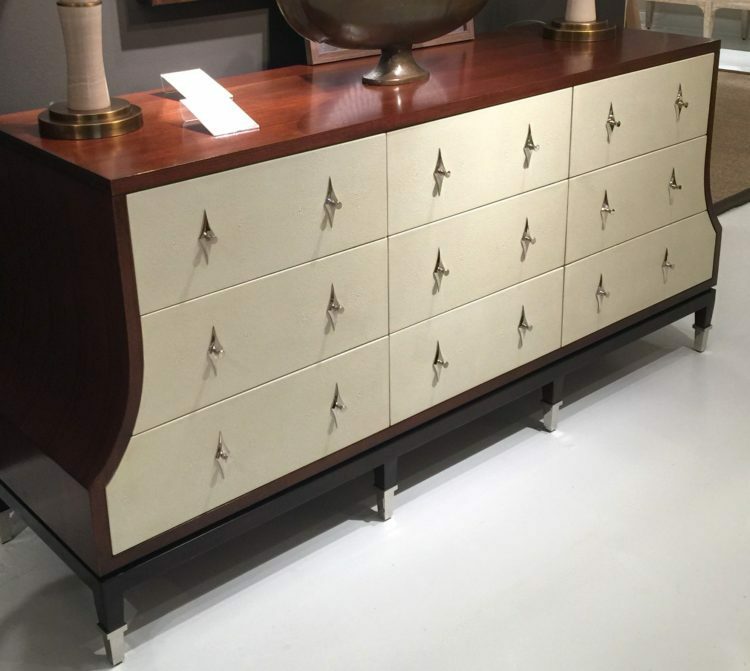 Known for the fresh, glamorous looks they always bring to market and the luxury hardware accents they use, long time Hadley Court favorite Bernhardt Furniture did not disappoint this market. 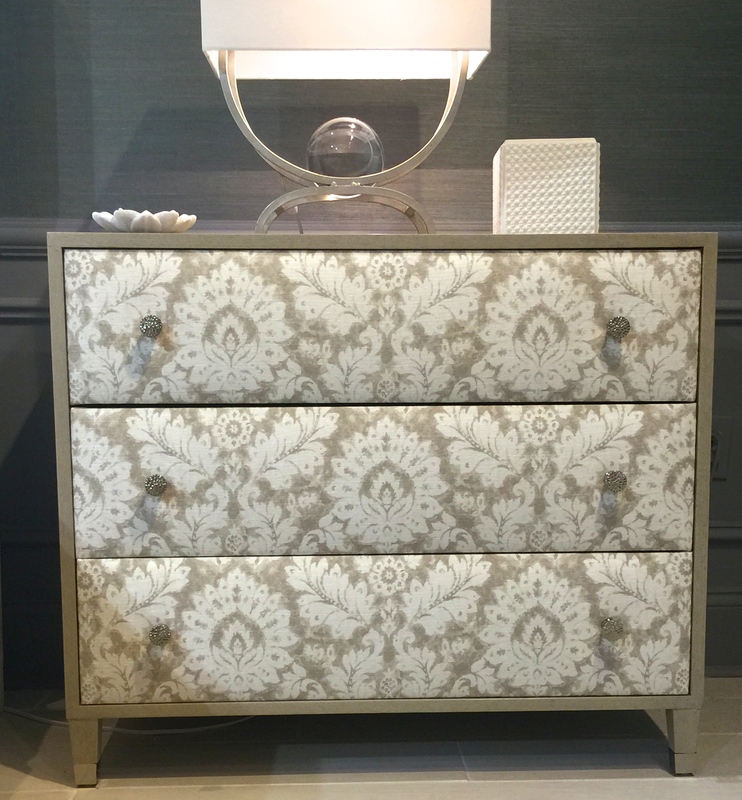 We loved many of their new pieces, but none more so than this stunning nightstand and the small, delicate, flower like hardware they used to set the padded, textured, fabric covered drawer front off to maximum advantage. 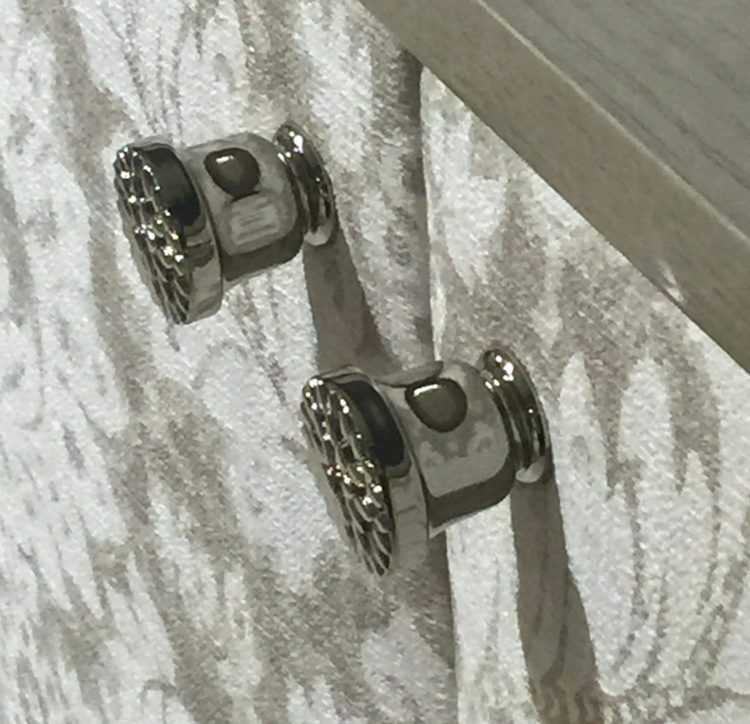 Also from Bernhardt was this scalloped-edge silver ring hardware. The nubby texture of the fabric covered door front combined with the glossy shine of the hardware is what makes this work so brilliantly, as you will see in the full image below. Another favorite manufacturer, Ambella Home, is also known for using jewelry – like hardware on their cabinetry, and the shapes of their furniture, as you will see in the next image, are often as pretty as the hardware. We applaud their craftsmen and women for their cabinetmaking skills. 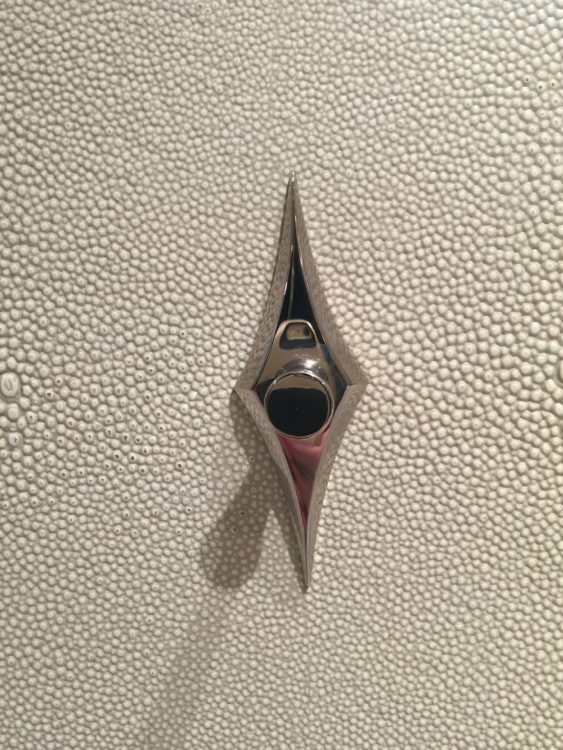 The beveled edge detail of this luxury hardware accent, set against the shagreen door front, elevates it to a different level. 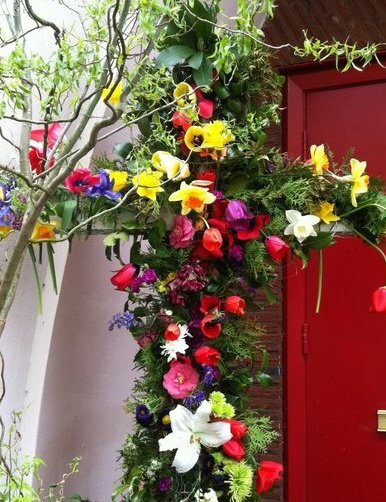 Isn’t this beautiful? Look at the ferrules on the tips of the legs, too, and the reveal between the cabinet itself and the structure supporting it. Every detail has been carefully crafted. Using accent tassels to top of gorgeous hardware reminds us of how women use a pretty set of fringy eyelashes to set off their eyes to best advantage when going out for a grand evening and noone used them better this market than our friend, celebrity interior designer, Tobi Fairley. 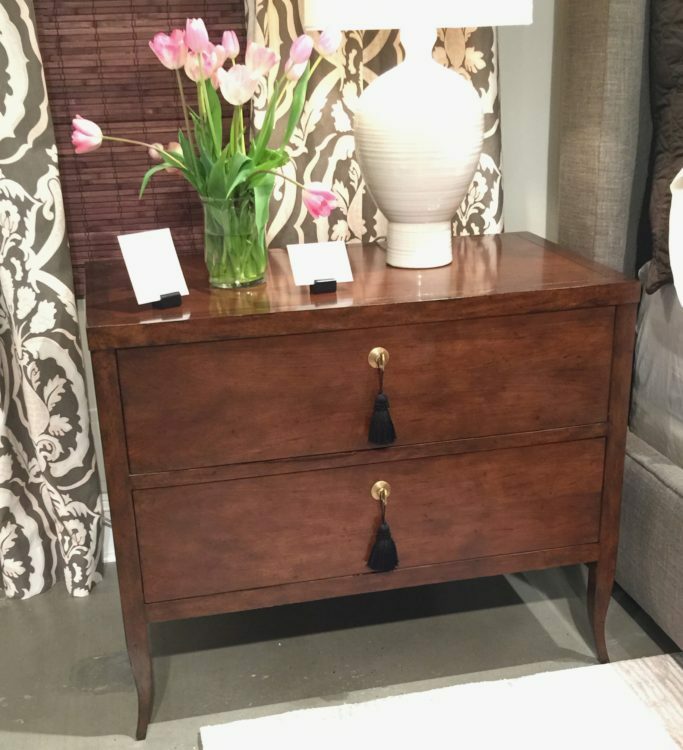 At an extremely reasonable price, Tobi’s classic, lovely nightstand for Woodbridge Furniture, shown at the C.R.Laine showroom, was set off to perfection with its brushed brass key hardware ending with this pretty black tassel. And, as Tobi, Leslie and every designer knows, that tassel could be replaced with any color of tassel to coordinate with your bedding. 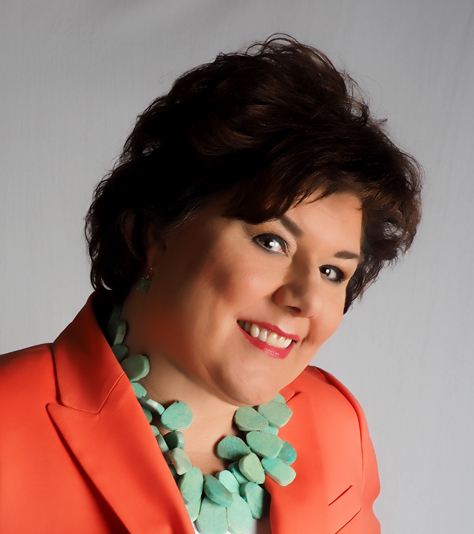 We think our friend, Jana Platina-Phipps, aka as @TrimQueen, could help you with that selection. Jana knows her trims and tassels! 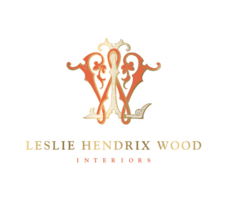 Here in Texas, and especially in and around West Texas where Leslie Hendrix Wood lives and practices interior design in Midland, ranching and horses are big businesses and recreational activities. 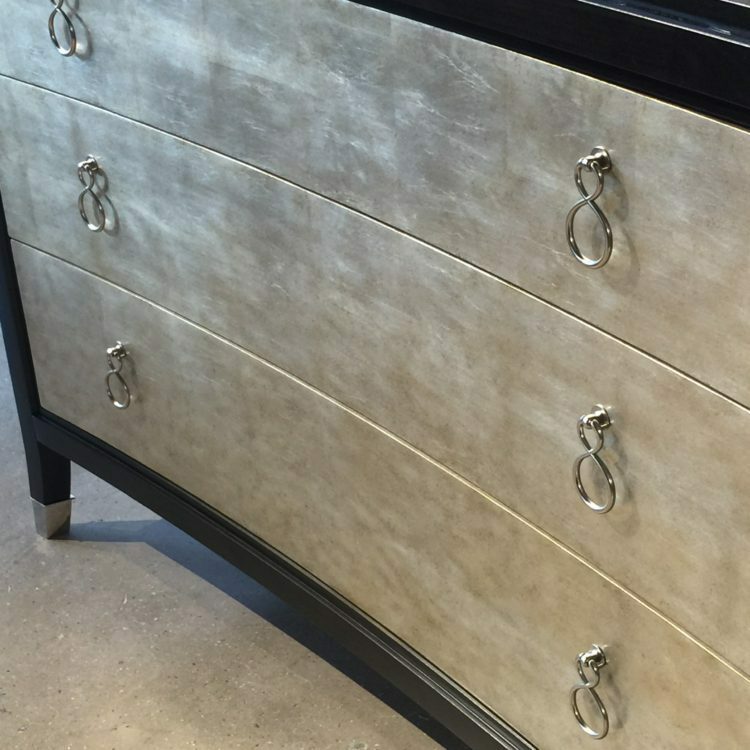 Julie Browning Bova [ you might have recently seen her on The Ellen Show ], is well known for her equestrian detailed line of furniture for Stanford Furniture, but this market the hardware she used had a new luxuriousness that we haven’t seen before. This cocktail table Julie designed shows it off to best advantage and we just loved it. Many of Julie’s upholstered pieces also have equestrian details like this and, readers with ranches, if this appeals to you, too, we encourage you to contact Leslie to show you more of Julie’s well priced line. Another favorite mfg. 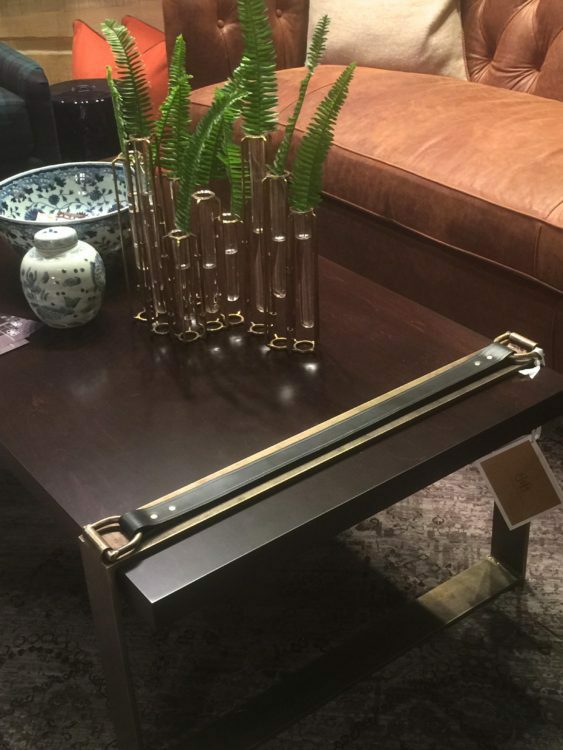 of interior designer Leslie Hendrix Wood, Century Furniture, also took their luxury hardware to another level this market. 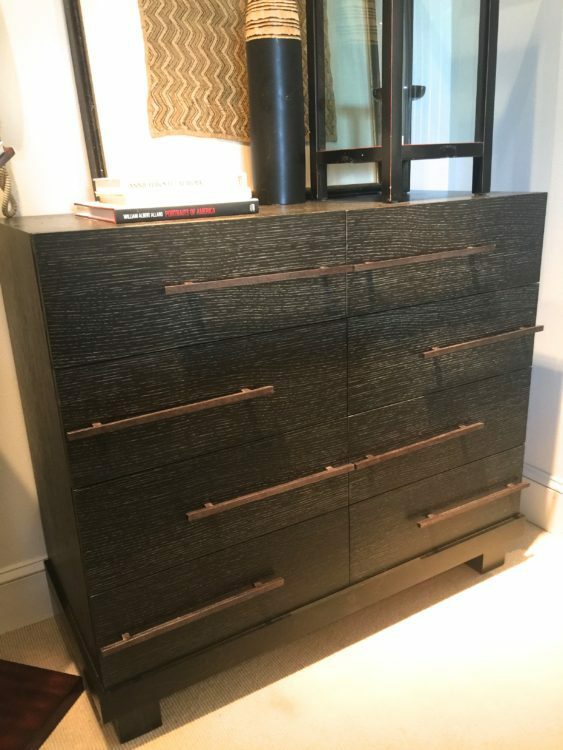 These elegant handcrafted horizontal brass bars, and the way they were placed on this cerused oak chest of drawers made this piece of functional furniture into a work of art. The solid bronze handcast set of door handles from new exhibitor, Dupuis International, below, took our breath away. The solid walnut cabinetry of this piece [and the way it smelled inside when you opened the doors ] spoke to us almost as much as these door handles. This is a manufacturer to watch if your taste leans towards modern, clean lined furniture with an edge. 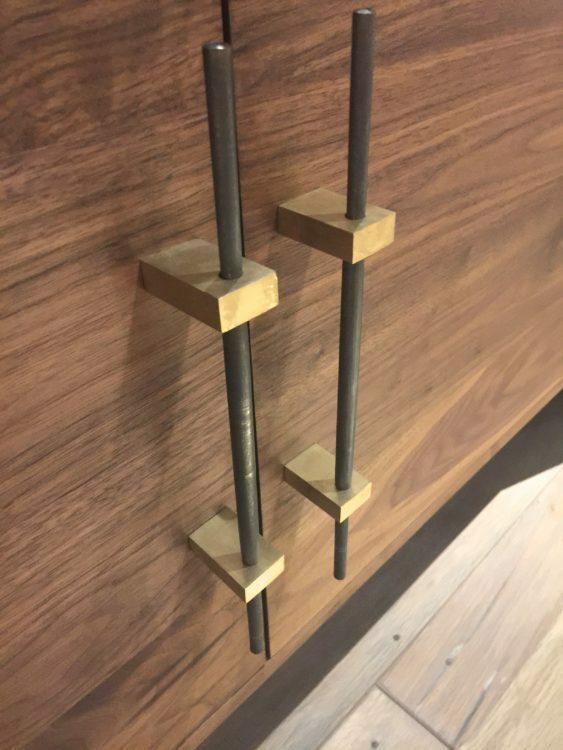 We are going to end this post today with images of the lovely furniture hardware being used by the company that sponsored the first #ElevateAwards at High Point Market: Universal Furniture To The Trade. 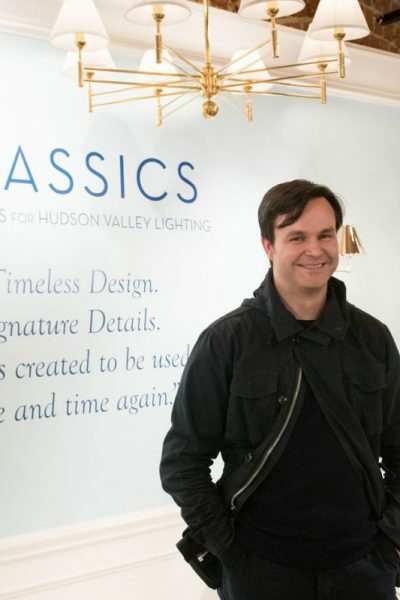 Universal Furniture To The Trade underwrote a *by invitation only* elaborate luxury sit down dinner and open bar event organized by Sara Ledterman, the owner of Adorno Magazine, for the top interior designers, manufacturers and influencers at #HPMKT. At this dinner, #ElevateAwards were given out to Suzanne Kasler, Mary Douglas Drysdale, Greg Natale, Gary Inman, Susan Macon Jamieson, Malene Bennett, Schwung Home, Susan Hable and many other deserving recipients who represent the best in international design today. 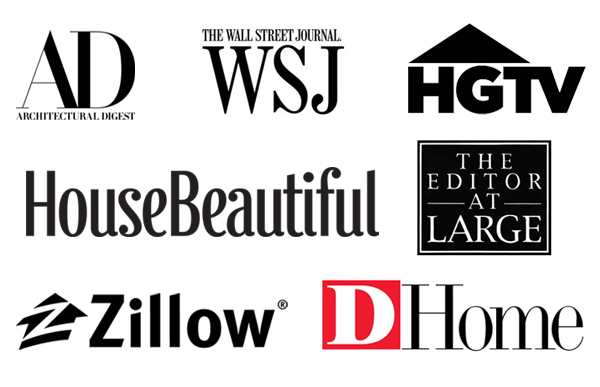 It was a night to remember and here at Hadley Court, we’d like to say thank you, Universal Furniture To The Trade, for your commitment to elevating luxury interior designers and design through your sponsorship of this magnificent evening. We appreciated your generous hospitality. 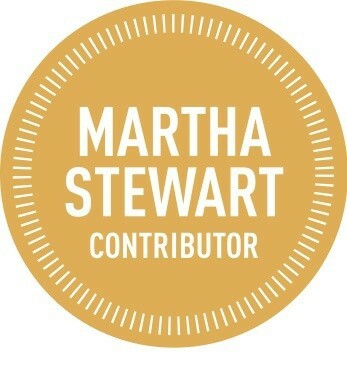 We hope you’ve enjoyed today’s post and we invite you to enter the tag: #HPMKT into your Facebook or Instagram search browsers, to see many more High Point Market re-cap posts from our designer and design blogging friends who were also there. 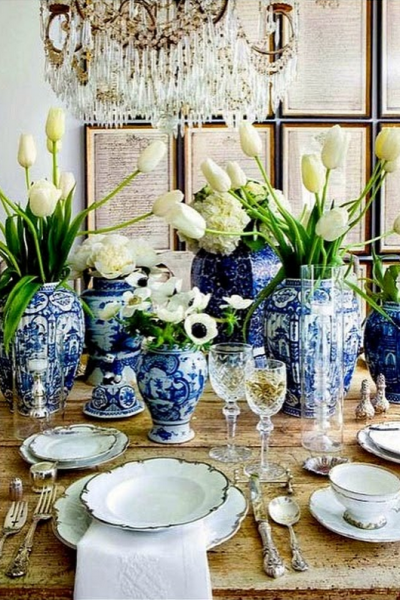 « Hadley Court’s *Must See* New Collections at Spring 2016 High Point Market!